Britt's visit with the Redskins didn't result in a contract, John Keim of ESPN.com reports. Analysis: Coming off an ugly 2017 campaign followed by a season out of the league, Britt is looking at a difficult path back to NFL relevance. He'll turn 31 in September and doesn't have much experience playing special teams. Britt is visiting the Redskins on Monday, Ian Rapoport of NFL Network reports. Analysis: Britt spent the 2018 campaign out of football after the Patriots released him Aug. 22 due to persistent issues with his hamstring. Seemingly back to full strength, the 30-year-old will need to battle for a roster spot wherever he signs, even if it's a team like Washington with an incredibly weak depth chart at wide receiver. Britt previously played with Redskins quarterback Case Keenum for the 2016 Rams during the lone 1,000-yard season of the wideout's career. Britt (hamstring) scheduled a workout with the Patriots on Monday, Ian Rapoport of NFL Network reports. The Patriots plan to release Britt (hamstring), Ian Rapoport of NFL Network reports. Britt (hamstring) feels like he's fallen behind while missing practice this summer, Mark Daniels of The Providence Journal reports. "You never know with a hamstring. One day you feel good. Then something's in the air and [it's] popping," Britt said. "I definitely feel like I'm behind, because I'm not out there with the guys getting the chemistry that I need with the quarterbacks and just with everybody on the same page with what we do." Britt (hamstring) is not on track to play in Thursday's preseason game against the Eagles, Mike Reiss of ESPN.com reports. Britt (hamstring) remains limited at practice, Zack Cox of NESN.com reports. Analysis: Britt has yet to practice fully this summer, which is less than optimal, considering some of the Patriots' other injury issues at wideout, as well as Julian Edelman's looming four-game suspension. We'd be surprised if Britt played in Thursday's preseason tilt against the Eagles, so look for the wideout to make his push for a key role in the offense during the last two weeks of the team's preparation in advance of Week 1 action. Britt (hamstring) was a limited participant at Wednesday's practice, Ryan Hannable of WEEI.com reports. Britt (hamstring) didn't practice Tuesday, Ben Volin of The Boston Globe reports. Britt (hamstring) returned to the practice field Friday, NESN.com reports. Britt (hamstring) will start training camp on the Physically Unable to Perform list, Mike Reiss of ESPN.com reports. Britt did not participate in Wednesday's mandatory minicamp practice due to a hamstring injury he sustained Tuesday, Mike Reiss of ESPN.com reports. Analysis: Britt signed with the Patriots late in 2017 after being waived by the Browns, totaling two catches for 23 yards in the three games he appeared in with New England. The veteran wideout has plenty of competition to beat out to not only see playing time, but also to make the 53-man roster. He will sit out at least one practice before returning to the field. Britt was the receiver "who stood out most" during Tuesday's OTA session, ESPN's Mike Reiss reports. Analysis: The 6-foot-3, 223-pounder is looking to get back on track after a rough 2017 campaign in which he was limited to 20 catches for 256 yards and two TDs in 12 games (including nine with the Browns). The 10-year pro is currently flying under the radar in fantasy circles, but Reiss noted that Britt was running well Tuesday and if the 29-year-old can develop a good rapport with QB Tom Brady, there's bounce-back potential here. 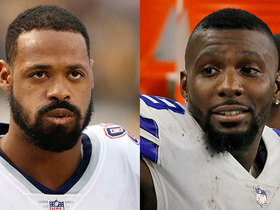 In the aftermath of Tuesday's trade of Brandin Cooks to the Rams, Britt is among the Patriots wideouts who could see an expanded role in 2018, Mike Reiss of ESPN.com reports. The Patriots picked up Britt's team option for the 2018 season Tuesday, Ian Rapoport of NFL Network reports. Britt finished the 2017 regular season with 20 catches on 42 targets for 256 yards and two TDs in 12 games, including nine contests with the Browns and three with the Patriots. Britt (coach's decision) is inactive for Saturday's divisional-round game versus the Titans. Analysis: After joining the Patriots on Dec. 12, Britt played a combined 40 offensive snaps in the final three games of the season. With Chris Hogan healthy again, though, the Patriots don't have a need for the veteran wide receiver in their playoff opener. Britt did not catch any passes in Sunday's 26-6 win over the Jets. Analysis: Britt was targeted twice in the contest, but he has yet to get much going in a New England uniform in his short stint with the team. Looking ahead to the postseason, Britt will continue to profile as a depth option behind fellow wideouts Brandin Cooks, Chris Hogan (shoulder) and Danny Amendola. Britt, who was on the field for two of 60 snaps on offense in Sunday's 27-24 win over the Steelers, caught his only target in the contest for seven yards. Analysis: Britt, who joined the Patriots just last week, quickly got into the team's wideout mix with Chris Hogan out with a shoulder injury. Once he gets up to speed with the team's playbook, the wideout should see more snaps, but as long as Brandin Cooks, Danny Amendola and Hogan are around, Britt profiles as a depth option for New England. Britt is listed as active for Sunday's game against the Steelers, WEEI.com reports. Analysis: Britt gives the Patriots some added wideout depth with Chris Hogan out with a shoulder injury, but we'd like to see the team's recent signee get a full and productive game under his belt before recommending him as a fantasy lineup option. Britt is part of Sunday's game plan and should be active for the Patriots' 4:25 ET game against the Steelers, Ian Rapoport of NFL Network reports. Analysis: The recently signed Britt is thus expected to join the Patriots' pass-catching mix in Week 15, with Chris Hogan (shoulder) looking like a no-go Sunday, per Adam Schefter of ESPN. Britt is still a fantasy dart in his anticipated debut with the Patriots, but should he click with QB Tom Brady, he could factor in down the stretch and into the postseason. Britt practiced with the Patriots on Wednesday, Mike Reiss of ESPN.com reports. Analysis: Britt, who signed a two-year contract with the Patriots, adds depth and size (6-foot-3, 223 pounds) to the team's receiving corps, but it's unrealistic to expect an immediate fantasy splash from the 29-year-old. Brandin Cooks, Chris Hogan and Danny Amendola continue to head New England's wideout corps, so Britt's main competition for snaps, once he gets up to speed with the playbook, will be current No. 4 WR Phillip Dorsett. Britt is finalizing a deal with the Patriots Field Yates of ESPN reports. Analysis: After Monday night's struggles in the passing game without Rob Gronkowski (suspension), the Patriots will look to Britt to add some much-needed depth to their wide receiving corps. Britt was waived by Cleveland last Friday and went unclaimed on waivers Monday. In nine games with the Browns this season, Britt caught 18 passes for 233 yards and two touchdowns. Britt wasn't claimed on waivers, Field Yates of ESPN reports. The Browns plan to waive Britt (ankle) on Friday, Adam Schefter of ESPN reports. Britt (knee) was limited at practice Wednesday. Analysis: Britt had plenty of time earlier this season to carve out a role in the Browns offense and didn't do a ton with the opportunity. Though the knee issue likely won't keep Britt off the field Sunday against the Packers, he won't be in line for many snaps now that Corey Coleman and Josh Gordon are back in the mix following lengthy absences and have reclaimed starting receiver roles for the Browns. Britt was on the field for just 19 percent of the team's offensive snaps and caught two of three targets for 10 yards during Sunday's 19-10 loss to the Chargers. Analysis: Of the five wideouts who saw field time Sunday, Britt earned the fewest amount of snaps, as Josh Gordon's return greatly cut into his role. Britt -- who has just 18 catches -- has been a huge disappointment in 2017, and his role doesn't figure to be changing any time soon. Britt (knee) doesn't carry an injury designation for Sunday's game against the Chargers. 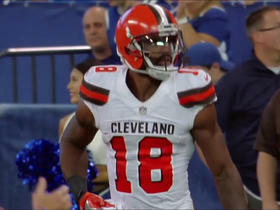 Analysis: Now that both Corey Coleman and Josh Gordon (suspension) are available for the first time all season this week, Britt's fantasy upside, which was limited to begin with, takes another hit. Through eight games, Britt has logged just 16 catches for 223 yards and two scores, numbers that don't align very well with the four-year, $32.5 million contract he signed with the Browns back in March. Britt (knee) was limited during Thursday's practice. Analysis: The Browns are likely just being cautious with Britt, and we expect him to head into Sunday's matchup against the Chargers without an injury designation. However, with Josh Gordon back in the starting lineup, Britt's involvement in the offense will be scarce. Britt (knee) was limited at practice Wednesday, Nate Ulrich of the Akron Beacon Journal reports. 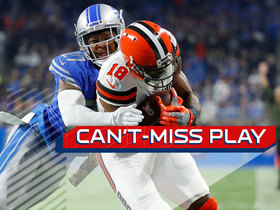 Analysis: With Corey Coleman back in the mix and Josh Gordon (suspension) poised to return to action this weekend, Britt's fantasy appeal is waning, though it was never that high anyway. In the Browns' Week 12 loss to the Bengals, the wideout parlayed 18 snaps into two catches for 52 yards. His limitations at Wednesday's practice were likely maintenance-related, and it wouldn't be surprising if Britt ends up approaching Sunday's game against the Chargers without an injury designation. Britt hauled in both of his targets for 52 yards during Sunday's 30-16 loss to the Bengals. 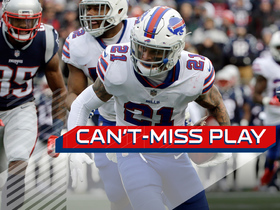 Analysis: This was Britt's fourth straight game with two receptions, and while his production has been lackluster this season, it could continue to fall with Josh Gordon expected to return next Sunday against the Chargers. Gordon, Corey Coleman and Ricardo Louis figure to see the most field time going forward, leaving Britt -- who played just 18 snaps Sunday -- on the sidelines. Britt (knee) doesn't have a designation in advance of Sunday's game at Cincinnati, Nate Ulrich of the Akron Beacon Journal reports. Analysis: Limited by a knee injury this week, Britt will nonetheless be available Week 12, albeit in a reserve role. Corey Coleman and Ricardo Louis should receive the most attention among Browns wideouts, but a handful of targets could trickle Britt's way throughout the contest. 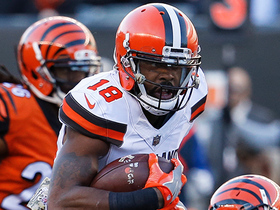 Analysis: With Corey Coleman (hand) back in the starting lineup for the Browns' Week 11 loss to the Jaguars, Britt was out-snapped in the contest by Coleman, Ricardo Louis and Rashard Higgins, while catching both of his targets for just five yards. Britt should be available Sunday against the Bengals, but he's a low-upside fantasy option in Week 12, and his value may only dip in the final quarter of the season in light of fellow wideout Josh Gordon's (suspension) impending return. Britt will concede his starting role to Corey Coleman (hand) on Sunday against the Jaguars, Scott Petrak of the Elyria Chronicle-Telegram reports. Britt (knee) doesn't carry an injury designation heading into Sunday's game against the Jaguars. Britt (knee) was a limited participant in Thursday's practice. Britt (knee) was limited at Wednesday's practice, Nate Ulrich of the Akron Beacon Journal reports. Analysis: Britt has been on the injury report for much of the season, including last week when he was also limited at Wednesday's practice but returned to full participation by Friday. He caught two of three targets for 38 yards and a score in Sunday's 38-24 loss to the Lions, but the solid showing may have been a case of too little too late, with Corey Coleman (hand) expected back for Sunday's nightmare matchup against the Jacksonville defense. Britt grabbed two of three targets for 38 yards and a touchdown during Sunday's 38-24 loss to the Lions. Analysis: After not finding the field in Week 8, Britt bounced back a bit against the Lions when quarterback DeShone Kizer connected with him on a short pass that required a nice juke move from the 29-year-old for Cleveland's first touchdown of the day. He hauled in just one other pass over the remainder of the game, but it was nonetheless one of his more productive outings as a member of the Browns. The nine-year veteran has just 12 catches for 166 yards and two touchdowns this season. Britt (knee) no longer carries a Week 10 injury designation after practicing fully Friday. Analysis: Britt was limited Wednesday and Thursday but is now on track to be available Sunday against the Lions. How much of a role he plays this week remains to be seen, with a wait-and see approach in order after the wideout suited up Week 8 but did not actually play any snaps. The 29-year-old has caught just 10 of 27 targets for 128 yards and a TD through five contests. The Browns were no doubt hoping for more when they signed Britt to a four-year, $32.5 million deal back in March. Britt was limited in Wednesday's practice due to a knee issue. 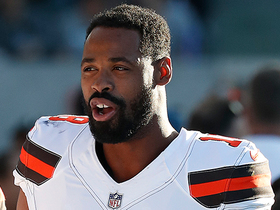 NFL Network Insider Ian Rapoport reports on the New England Patriots' re-signing of wide receiver Kenny Britt. 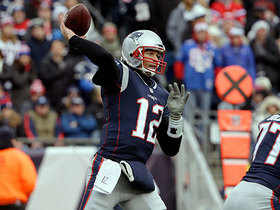 New England Patriots QB Tom Brady hits wide receiver Kenny Britt for a 16-yard catch. Buffalo Bills safety Jordan Poyer picks off New England Patriots QB Tom Brady and takes it back for a TD. 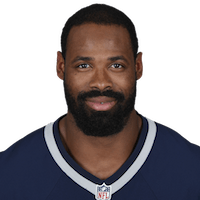 NFL Network Insider Ian Rapoport reports that the New England Patriots have signed free agent wide receiver Kenny Britt. 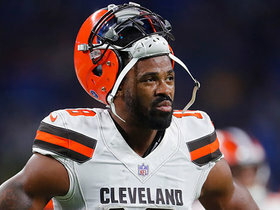 NFL Network insider Ian Rapoport reports that the Cleveland Browns have waived wide receiver Kenny Britt from their roster. Cleveland Browns quarterback DeShone Kizer throws a strike to wide receiver Kenny Britt for 38 yards. 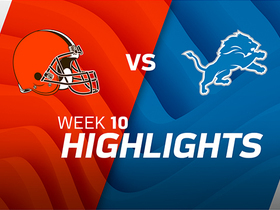 Watch the highlights from the Detroit Lions 38-24 victory over the Cleveland Browns in Week 10 of the 2017 NFL season. Cleveland Browns wide receiver Kenny Britt stiff arms defender, and goes in for 19-yard touchdown vs. the Detroit Lions in Week 10 of the 2017 NFL season. 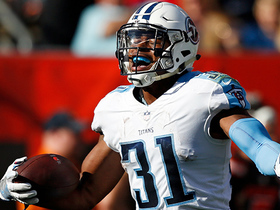 Tennessee Titans safety Kevin Byard picks off Cleveland Browns quarterback DeShone Kizer for an interception in Week 7.